Sticks and cups, am I talking about a tarot pack or cooking measurements? As any cook searching for recipes on the internet knows, this is how the ingredients in American recipes are measured. America likes to cook by volume rather than weight; they talk of ‘tablespoons’ of butter. Americans assume that the whole world buys butter in sticks and that we know how much it weighs (90g? 110g?). There is the added complication that American pounds, pints and quarts when used, contain a different amount of ounces to the British pound (an American quart is 32 fluid ounces, but 40 for a British, Australian, Kiwi quart). Worn out by the mental calculations, I have to admit an uncharitable thought crossed my mind, perhaps Americans are too thick to use scales? No, but this recent article in the Wall Street Journal states that U.S. cookbook publishers think that for Americans, “weights tend to look daunting”. Precision, especially in baking, is essential. French baker Richard Bertinet is so keen on accuracy that he even recommends weighing water in grams rather than measuring millilitres in a jug. Those casual references in recipes to a pinch of salt (1/16th of a teaspoon), a dash (1/8th) of vanilla essence, a smidgeon (1/32th) of spice, a glug ( a very quick down and up pour) of oil are micro measurements not to be taken lightly. Old recipe books always used visual quantities: a hen’s egg (1/4 of a cup), a pullet’s (a hen less than a year old) egg (slightly less) or a walnut of butter. English cookbook writer Nigella Lawson famously adores, even sells the American system of cups and helpfully provides a conversion scale while the legendary American cook Alice Waters in The Art of Simple food stresses the importance of weighing. Although I can understand the appeal of being able to picture an amount you might need for a recipe, I agree with Alice: a cup of flour is different depending on the weather, the humidity, the shakiness of your hand that day, the amount of gunk that is stuck in the bottom of your chosen container after the second or third cup. All these factors can affect the success of your recipe. I’ve worked out an American cup (even their cup sizes are different from ours) is 150g of flour, Nigella says it’s 140g and the Wall St Journal article says 120g sifted. That can make the difference between wasted ingredients and time; failure and success. Another method is explained in a new book ‘Ratio: the Simples Codes Behind the Craft of Everyday Cooking’ by American author Michael Ruhlman who takes the traditional 1-2-3-4 (butter, sugar, flour, eggs) American cup ratio recipe for making a cake and applies it to all cooking. Professional chefs and bakers guard their ratios carefully as secrets of the trade. Ruhlman says that following ratios will ‘unchain you from recipes’ and gives a table: Bread-5 parts flour; 3 parts water (plus yeast and salt). Change this ratio slightly, 3 parts flour, 2 parts egg and it becomes pasta dough. A reluctant converter to metric in other areas of life, I like inches, feet and yards as they are based on the natural measurements of the human body: an inch is a thumb (in French the words ‘inch’ and ‘thumb’ are identical: ‘pouce’), a yard is the distance between the end of your nose and the fingers of your arm outstretched. However in cooking I use grams and litres rather than the ounces and pounds of my childhood. What system do you use to measure? Are you comfortable with cups? Or do you groove to grams? How do you measure up? Being an 'Old Fashioned' Bakelady I have to confess to using imperial measuements. I prefer not to use cups because, as you say, they can be so inaccurate ie; do you tap the flour down in the cup before you measure it. A good pair of scales is essential, not those 'Arty' clock type Weighing scales where the arrow moves around and you cannot get an accurate measure. And never, never mix gramms with imperial, that's asking for desaster. Yes I have some of the arty clock type scales which is merely on display and a flat digital scale which is what I actually use! Great diversionary tactic from writing. I think you can get carried away with accuracy. I just convert american weights to metric using conversion calculators you can easily google. Digital scales are great till the battery runs out – normally when you're flat out cooking and have no time to spare to buy one. There's probably one reason why nigella likes US measurments – helps sale of books. When following recipes properly (rather than just taking them as a starting point or for inspiration) I do like to follow them accurately, so that I can make the recipe as it was created by the author. After that, I can make my own tweaks and adaptations according to my preferences and opinions on what would make it better. And to follow accurately, I prefer an accurate method of measurement. For me cups is so arbitrary. It just about works for fluids and powdered ingredients, though as you rightly point out, these can be affected by humidity amongst other factors. But what about when one sees cup measurements used for fruit and vegetables. "One cup diced onions" could vary immensely. Not to mention that a cup of peeled chopped this or that makes it virtually impossible for me to know how much to buy. If a recipe tells me 200 grams diced onions, I know to buy an onion that weighs a little over, to allow for peeling and discaring both ends. If I'm told I need a cup of diced onion I have no idea! For some types of cooking, especially once one is familiar, it's not so important to be accurate. We can go by instinct, a little. Only when we have the experience, of course. For other types of cooking, and for any that is unfamiliar, accuracy helps. I have to say, I love the US system, it is so simple and the little cups tidy away so neatly. I'm no baker so anything that makes life a little easier gets my vote! I grew up in Australia with the Australian Women's Weekly recipes, all in cups. This how I learnt to bake, and I never had a disaster. In fact as a poor and poverty stricken student I used a tea cup or a mug, and still managed to bake successfully. However now I use grams, my fly-by-the-seat-of-your-pants attitude has deserted me, and accuracy is important. James: isnt it? good point tho re books. Kavey: it is odd isn't it? Kylie: in Australia do they use cups generally? I have cup measurements for when I try an American recipe but it often means you have an extra thing to wash up or for the ingredients to stick to. Have you ever measured a cup of butter or fat and then tried to prise it out? Much easier in my opinion to weigh it on digital scales directly into the bowl you are about to mix it in. Your earlier post about making marmite cupcakes was brilliantly accurate and thanks for the tip about weighing the amount you put in each cake 'well'. As you say baking needs accuracy – however I detest this sort of prescriptive direction in other types of recipe. Why would you measure a tablespoon of olive oil when frying something? I think it's the stubborn side of me not wanting to be told what to do! My go-to cookbook is the Joy of Cooking (I'm American) and I use cups, tablespoons and the like when using it, except for butter where I use 1T = 1/2 oz. I love my scale, too, and miss it when I'm in the US. I have a 10year old Salter digital scale which weighs to the gram or 1/4 ounce. However I grew up using cups, although weights were given in some recipes. There didn't seem to be any set standard. In Home Ec we were taught to measure things in cups – pack the sugar down tightly, use a knife to even off the flour, never shake it. These days I far prefer scales though. I had a fit the other day when my Salter scales (with a 15 year guarantee) broke after six months of use. Had to go out early on a Saturday morning to replace them as I couldn't do without. I hate having to weigh out stuff – I'm a real just bung it in girl. I often don't have scales to hand so I just use a tablespoon where I can and use google to assist with conversions…not going to work with baking really I know…need to get into better habits! I usually use kg/g with the odd tsp/tbsp . I just don't feel confident or trust using cups as I feel there is such a huge margin of error. As for scales I have a great set of flat digital scales, but when the battery decides to die I have a pair of traditinal scales with weights down to 5g. 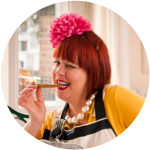 When it comes to savoury i'm a bung it in girl too….but baking…that's a recipe for disaster! I struggle a bit with some of my older cookbooks, never having had to use imperial, grams & kg on a digital scale are the go really. I was given a set of Nigella measuring cups as a gift,I promptly dropped and cracked the cup and lost the 1/2 cup (? ),but the 1/4 cup works perfectly for measuring my cat's bikkies (she is a very posh puss)and if I ever need to measure a 1/3 of a cup of anything, I do still have that one left…..
"You'll notice in my recipe's ingredients list that I'm a little light on numbers. This isn't some dreadful error on my part, nor some go-as-you-please hippyishness. No, I'm following in the path of that quintessentially Victorian figure Mrs Beeton, who laid out the classic recipe for the Victoria sponge in her 1861 Book Of Household Management. In her recipe, the cake is made from equal quantities of eggs, butter, sugar and flour. You simply weigh the eggs in their shells and then measure out the same amount of butter, sugar and flour. So if the eggs just happen to weigh 250g, then you want a 250g block of butter and 250g of everything else. They won't, of course, but you must do what the eggs tell you – that's the fun of it." Oh wow Animal disco, that's worth a try isn't it? I'm now comfortable with cups and weights, though I have written down what a cup of butter weighs. My new, digital scales were worth the cost and I mostly use grammes these days, rather than imperial measurements. However, I also guess a lot. I'm a scientist by day so it will be no surprise that I measure everything by weight(including liquids as measuring jugs aren't very accurate) using digital scales and always use grams. I often scale recipes up or down and my brain cannot do that in imperial measuremtns. Animal Disco raises a good point about eggs though as these vary in size. To my shame I generally weigh these too… especially if I am making macarons or meringues. The ratio iphone app is brilliant for this as you can input the weight of your eggs and the app automatically adjusts the other ingredient quantities. I've just started reading Ratio, have been meaning to get it for ages and your post reminded me. It's great. When converting recipes I tend to leave cups for wet ingredients although I need a second set of measuring cups to avoid having to wash up repeatedly! According to my calculations a cup of butter is 220 grammes.